At a time when the costs of medical care benefits are on the rise, many companies are looking carefully at ways to encourage wellness in the workplace. For many employees 25-30% of their meals are eaten at work. Providing employees with the benefit of healthy nutrition at work and encouraging healthy eating behaviors for life is one simple way to do just that! Last month was National Nutrition Month. Maintain the momentum you started in March by continuing to promote healthy eating in the workplace as part of your workplace Wellness Program. Here are four questions to keep in mind to promote employee health and happiness. What Can a Wellness Program Do for Your Organization? The first step of any Wellness Program is to understand how it benefits you and your employees. Without the knowledge of how your diet affects health and happiness, you can’t efficiently promote the importance of nutritional health practices to your employees. While you can state the importance of exercise and daily physical activity all day, many of us overlook the value of nutritional food choices. Here are some of the benefits to take into consideration for your Wellness Program. Nutrition promotes health benefits such as heart health, brain health, bone and teeth strength, weight control, and even higher energy levels. Nutritional health results in feeling happier. A higher level of self-confidence. When you feel good, you feel good about yourself. Who doesn’t want employees who are confident in themselves? How Does the Work Environment Determine Food Choices? How easy—or difficult—does your office make it for your employees to make smart food choices? Do your employees order in on a daily basis so they don’t have to be away from the desk for extended periods of time? Do they pack unhealthy or non-substantial lunches in the morning in a rush to get to work on time? If so, help them make it easy! Offer your employees designated areas for food storage and kitchen space to prepare their own lunches. Make a monthly office grocery list full of nutritious snacks for your employees to access during the workday. By offering options, you can help your team eat better and feel better. Could Your Team Be Eating Meals Together? Do you find that many of your employees spend their lunches at their desks? No doubt they end up ordering their meals in or swinging by the local fast food place to pick up something quick and easy. These are not the healthiest behaviors, by far. Instead, encourage your team to have weekly meals together. If you have an office kitchen, suggest that everyone eats together to engage in conversation and enjoy each other’s company. Even if the conversation turns to office matters, you’re still engaging with your staff. During this time, you can even set the standard for nutritional eating by sharing your healthy eating habits. Encourage your staff to do the same. This practice also has the added benefit of furthering a sense of camaraderie in the office, which aids in retention. How Can You Promote Health with Lighthearted Competition? Competition can make the Wellness Program implemented into your workplace fun. You can do this by suggesting that your office compete in a nutritional food challenge. While you should make it clear that participation is not required (you don’t want to enforce the “tyrant of the office” mindset here), you can present a fun activity to encourage healthy eating. Each week or month, organize a contest based on the lunches that your employees bring in to work. Participating staff can earn points for healthier the food choices. At the end of your selected contest period, you can even award the employee who has earned the most points with a free healthy meal from your company cafe or a nutrition-inspired gift from your recognition award collection. Nutritional health can be fun! Hopefully, these four questions for healthier eating in the workplace will be helpful to your own implementation. 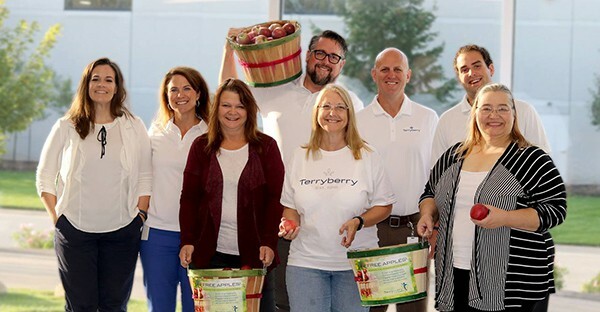 Contact Terryberry today to learn about nutrition-based wellness challenges. We’ll be happy to assist you.